With 20 days to my first-ever (6 kyu) grading exam I’ve started cramming stuff into my brain, and into muscle memory. Several months ago I copied all the requirements (for all tests through shodan) from the exam preparation page on the Aikido of San Diego web site, and pasted them into Google Docs spreadsheet. As I learn them I can make notes, and then review from time to time. Using Google Docs lets me access it from anywhere, including my iPhone when I have a spare moment. I have a paragraph or two of notes on each, from big “what is this” info to little tips on the finer points of execution. Sometimes just having a few key words is a huge help. “The zig-zag one, where you end with their arm pinned flat to the floor” (katete-dori shihonage omote), or “the one where you disappear behind Uke” (…ura), or the way-more-fun-sounding-than-it-really-is “smooshing a pie in Uke’s face,” (suwariwaza kokyu dosa). Now that I have the info down, I can sort of drill myself on it, mentally, and use visualization to practice each technique a few hundred times in my mind. Before last week I was uncertain about enough points that I didn’t dare work on memorization or visualization for fear of ingraining the wrong thing. I’m comfortable that I at least know what all the techniques are, if I were to hear the names called out, and can go through the motions of each. Now I need to get the names down flat, so I’ll still know what they are even under pressure and try to get a little finesse and flow in the execution of each. 6 training/mentoring days to go, and a 3-day Retreat. Acck! I’m also working on cardio & breathing, so I don’t get so winded I can’t see straight during jiyuwaza. I don’t know if Sensei sets students up in class so we get a direct and vivid understanding of our weakest points, but last Tuesday’s class pointed out that I need to deal with high-level, short-burst work more than I have been. This has been an intense couple of weeks. I’ve been at the dojo more often, have a mentor for my 6 kyu test, and I’ve been turned loose by my personal trainer with a set of core and shoulder exercises to do for the next few months. I’ll be doing a weekend retreat in the mountains with the dojo in September – mostly weapons – and am really looking forward to that. Through it all, I am determined to not only not neglect the other aspects of my life (home, critters, & work), but to do my best to complete projects, catch up on chores, and spend time with the beasties. It wouldn’t be budo, you know, to let the rest of life fall apart. So far, so good. I trained on Friday and Saturday, and then did a seminar on Sunday. The seminar was incredible. Not only was it plain fun and engaging, but it was the kind of experience that opens a crack in one’s way of being, letting light shine on many things not directly addressed during those two hours. It’s still sinking in, and will be for a long time. It’s hard to put into words. I tend to think in images, and the image for this one is of hands lifting a little fish out of a tide pool and releasing it into the sea. I’ll be training 3 days a week for a couple of weeks (a lot for me), and working with my mentor after each class. I need to be spending a lot more time on the elliptical trainer, too, and remembering to breathe during jiyuwaza. I get way too winded. I did a few things passably well in the seminar, too, and there were no times when I was overwhelmed and lost. Occasional glimmers of low-level competence… Heck, I’ll take em. I have been fairly comfortably going along, slowly, as an Aikido newbie. Working diligently and mindfully, but in no hurry. Plodding. No deadlines. Well, I recently passed our association’s minimum of 20 training days to test for the lowest rank, 6th Kyu. 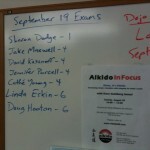 So I’ve been glancing with some trepidation at the dojo whiteboard, where names are posted of those who will be testing. Our next tests are on September 19th. I never thought I’d be in that batch. I thought maybe November (we have tests every 2 months, I believe). But I kept checking the board, just in case. On Thursday I stopped by the dojo, just to drop something off, and a friend in the class turned and pointed at the board. Yikes! It’s the damnedest thing. My (very) rational mind knows that everyone who shows up long enough, and who can roll without killing themselves, tests for 6th Kyu. It’s like "graduating” from kindergarten. What’s interesting though, in the “watching my mind blabbering on” sense, is that I am really excited about it. Giddy. Honored. Kind of silly, but there it is. I guess it’s been a very long road even getting to this point (including some challenges well before I ever set foot in the dojo). It feels just like I’ve been preparing for a wilderness adventure. I’ve heard stories and read books, learned some basics, gathered my equipment and supplies, gotten myself to base camp, met some of my fellow adventurers, and set up my tent. Now I’ve been casually invited to join up with the group at the trailhead in the morning. I’m excited about what lies ahead, and determined to be up to it. Who would practice all day with a glaive. ‘Til his motion was just like a wave. Whose waza was flashy and darin’. As her uke she slew. And all of the white belts were starin’. Who rolls in his own special way. And pops up on the preceding day. Just drop, and he’ll be on his knees. Yesterday I skipped participating in class, in favor of getting some video (potentially for the dojo’s Web site). It was our new shodan’s last day training with us (he’s off to college), and the light was beautiful. Sensei led the class through a lot of techniques. Also I was really tired (little sleep) and dizzy (vertigo acting up), so I kind “didn’t feel like” working very hard anyway. So it was a great opportunity to do the video, and it was fun doing that, but dang… I really miss having participated! In a sort of visceral “missing someone” sense. I’ve felt kind of off-balance since then. Interesting how much Aikido becomes part of us (and how quickly). Slow-motion video of the randori portion of Johnathon Purcell’s sho-dan exam. Apologies for the strobing from the fluorescent lights. One of my favorite sempai, Johnathon Purcell, tested for shodan yesterday. Here is slo-mo video of his first throw in his new hakama. He started at Aikido of San Diego when he was 11 years old. He’s off to college at UC Berkeley on Wednesday. He’s a perceptive and thoughtful student and teacher, kind and highly competent. I’ve been very fortunate to train with him since I started practicing Aikido in May. I and our whole dojo are going to miss him something awful. If you’re up that way, perhaps he’ll turn up at your dojo. Still digesting everything Nadeau Sensei said when he was here for a seminar. One way he suggests looking at things is that you (your body, hips, and hara) are “the vaccuum cleaner” and the techniques (what your arms and hands are doing) are just attachments. It’s the horsepower/amperage that make the machine powerful, not which kind of brush you snap onto the hose. I’m beginning to see some of the layers of the onion that Aikido is. One that seems to keep coming up in the past couple of weeks is misdirection, as in magic. Using atemi to draw uke’s focus, appearing to be rooted on the line of attack while actually preparing to rotate off of it, etc. Playing with people’s perceptions is fascinating stuff. I’ve discovered that, in spite of trying to stay relaxed, I’m doing something during bokken work that’s really hurting my neck muscles – the little ones on the front and sides. I think it’s a combination of weakness there, and of using the wrong muscles to compensate for others that are weak. So I have some new strengthening and stretching exercises to do. I’ve been slowly losing weight and getting into better shape. In part that’s because of actual Aikido practice, but also because of all the other work I’m doing so that I can do the Aikido practice better, and without hurting myself. I’ve been reading books and watching DVDs like there’s no tomorrow. I’ve been really enjoying George Ledyard Sensei’s 3 DVD set on Entries. Frankly, I was initially very interested to see how someone could fill 3 DVDs with “just” irimi. It’s great material. clearly presented. Ledyard Sensei is a great teacher and really very funny sometimes. I also got the Ukemi DVD by Ellis Amdur. I’ve only watched a bit of it so far – planning to watch the whole thing this evening. Classes have been a lot of fun, and we’ve been doing some interesting exercises, like discovering where your balance-breaking point actually is, and what you can do to recover and continue once you’ve hit it. I’m still exploring (as I expect I may be for years) my propensity to mentally seize up when I’m overwhelmed. I’ve been doing less of that lately, but only because I haven’t been overwhelmed. My Sensei (Dave Goldberg Sensei, at Aikido of San Diego) does a 2-hour workshop every couple of months, on a Sunday. I couldn’t do the last one because my shoulder was still a mess, but I’m looking forward to the next one, “Relax, it’s Aikido – Discovering and developing deeper relaxation with integrity for better results,” on the 23rd. Also coming up, in September, our dojo’s annual Aikido retreat: http://www.aikidosd.com/camp.htm. It’s held in the Cuyamaca Mountains (east of San Diego). Everyone who’s gone before is very excited about doing it again. I’m signed up, and now wrestling with the decision to camp in my tent (private, quiet, comfortable…) or in one of the shared yurts (fun, up half the night, bonding…). Off to groom the critters and clean their pen. Picking up manure has got to be good jo practice, right?